Clowns -- that's right, clowns -- are coming to Chicago this week to protest the "absurdity" of NATO and participate in the May 18 rally organized by National Nurses United. A group called ClownBloq announced its intentions Monday morning to demonstrate during the NATO summit, "to provide hilarity in the face of a humorless police state and to provide a fool's critique of organized and militarized oppression of the people," according to a press release. But ClownBloq organizer José Whelan soon laid out the group's strategy -- and without a pie to the face. 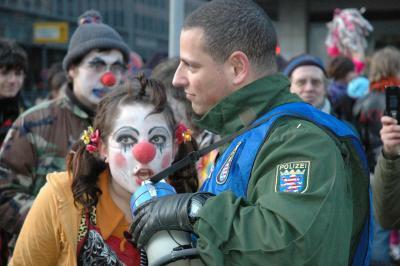 Clown protests, or clown blocs, have been used for years at events like the G20, Whelan says, with fully costumed clowns singing, dancing, and occasionally throwing whipped cream pies. "We’re not just here to shout and chant. We are here to have fun and enjoy ourselves," Whelan said. "If the revolution’s not fun, I don’t want to be involved." Those slightly surreal demonstrations are meant to contrast with the heavily armed police almost certain to be on the protest's sidelines. "As clowns, we’re trying to bring some hilarity to something that’s pretty serious—police using military tactics against citizens trying to use their First Amendment rights," Whelan said. "We connect ourselves to a long tradition of clowning, most recently Stephen Colbert at the White House Correspondent's dinner—the role of the fool in society to call out absurdities and point out when the emperor has no clothes." ClownBloq is organizing workshops run by professional clowns this week to help protesters find their inner clown, says Whelan, who is a street medic and will be dressed as a clown medic with an oversized syringe during the summits. Clown blocs are a take on black blocs, a popular European form of protest where protesters dress in all black, usually covering their faces. But black blocs tend to scare Americans, Whelan says. "The mainstream media has done a good job of connecting black blocs in the eyes of Americans to violence," he said. "We’re hoping a group of clowns confronting [state and police] violence may more clearly illustrate the absurdity of the violence. After all, we'll be there with silly string and whip [sic] cream pies." ClownBloq formed last week after AdBusters, the activist organization behind Occupy Wall Street, suggested protesters start a "laugh riot" during the NATO summit. "Laughter is one of the most powerful tactical weapons of memewar," the group wrote on its website. "It signals supremacy and loss of fear. So let’s pull off the greatest comedy of howling flash mobs, riotous street parties and hysterical pranks the world has ever seen." But some AdBusters commenters worried that a "laugh riot" might trivialize the Occupy movement. "I can just see CNN having a field day covering shabbily dressed people camped out by a government compound giving forced, awkward, and somewhat maniacal laughter on cue for the cameras. You won't convince people you represent them and their interests. You'll convince people you're a bunch of whack-jobs," the commenter wrote. Whelan hopes ClownBloq is able to articulate its message well enough to avoid providing fodder for critics. "All of the actions we’ll show up at are targeted messages," he said. "We’re very clear why we’re there. It’s not just there to have fun and dance around as clowns. We’re here because NATO’s here."